The French ereader maker Bookeen, a company which has been making ereaders since before the dawn of the Kindle, has just announced their first Android tablet. And just to add insult to injury, the Cybook tablet joins the crowded basic tablet market with a higher than average price and last year's cutting edge specs. Like the current Nexus 7, the Cybook tablet has a 7" screen with a resolution of 1280x800. It has a 5 point capacitive touchscreen, and it is running Android 4.0 on a a Tegra 3 CPU (speed unknown) with 1GB of RAM. Yes, I too am surprised at the outdated version of Android; new devices are shipping with Android 4.2 or (at least) Android 4.1. I have to wonder how long this model has been sitting around. The Cybook tablet is going to ship with 8GB of storage, a microSD card slot, a 2MP front-facing camera, Wifi and Bluetooth. This tablet also has GPS, a g-sensor, speaker/mike, and (assuming I read the spec sheet correctly) USB host. The Cybook tablet weighs in at 338g, making it a little lighter than the Nexus 7. The spec sheet mentions a 7 hour battery life (for video), and according to Bookeen this tablet is Google Certified and will ship with Google Play as well as the usual suite og Google apps. The Cybook tablet is going to be launched in partnership with the French retailer Relay, which will be selling this tablet in their 550 retail locations. The French retail price will be 159 euros, and it will include 10 free digital magazines per month during 3 months. On a related note, this is technically Bookeen's second tablet. The original Cybook Gen1 was based on a 10" LCD screen, ran Windows CE 3.0, and was released in 2003. That model was later superceded by various E-ink based ereaders, starting with the Cybook Gen3 in Fall 2007. Yes, Bookeen has come full circle. It's a pity they could not have come up with a better device. The Cybook tablet is best summed up as a nearly identical Nexus 7 clone. That doesn't sound too bad until you realize that the Nexus 7 came out a year ago, and here in the US we are seeing clones that have specs similar to the Nexus 7 and cost $50 less. The Cybook tablet, on the other hand, costs the same as the Nexus 7 - kinda. 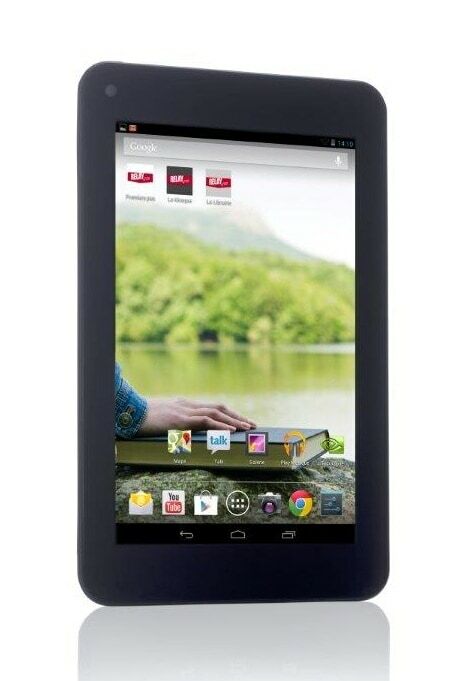 The Nexus 7 costs 199 euros in Europe, but it also comes with more storage (16GB). Arguably the prices are the same. If I were in the market to get a new tablet in Europe, I would wait for the new Nexus 7. That tablet will probably cost 199 euros and have a better CPU and better screen than the Cybook tablet. Good god, I thought they were toast five years ago.